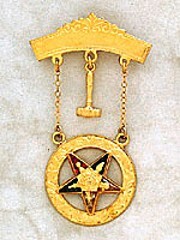 Masonic Past Master Rings 10KT Gold, Open or Solid Back. Gavel on on side of the shank and the Top Hat on the other. This ring is approximately 9/16th of an inch wide at the head of the shank. You can have this ring two-toned as pictured or all white gold. These are beautiful rings made by a high quality jewelry manufacturer. They are heavier than most rings made by our competitors. Expect to pay much more when purchasing this ring from a quality jewelry store!